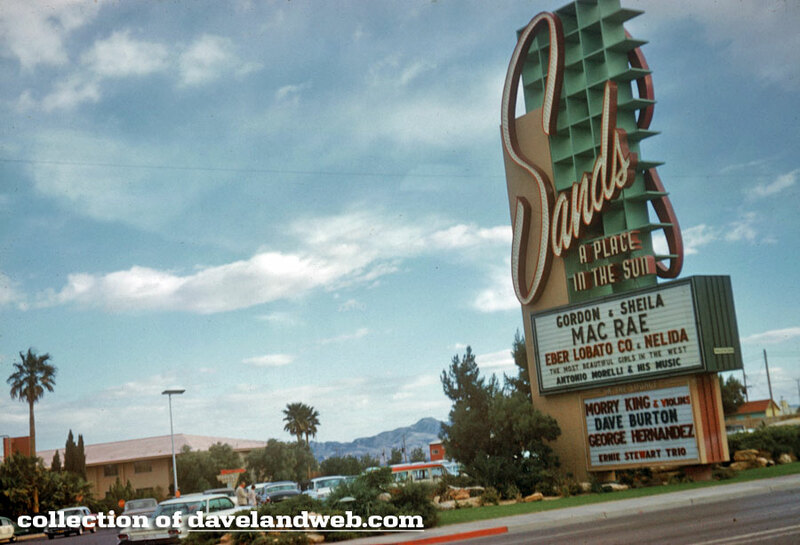 How about a spin through vintage Las Vegas, beginning with a June 1961 shot of the Sands Casino & Hotel? Husband and wife duo Gordon and Sheila MacRae are the headliners. 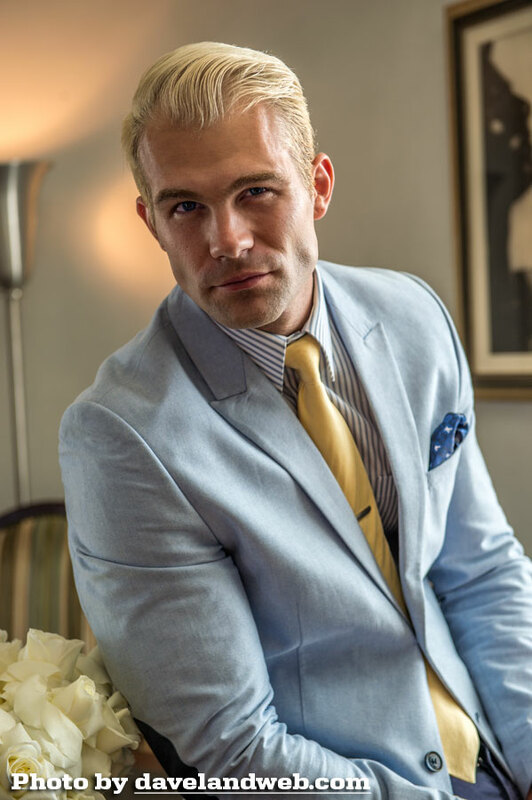 You might remember him from "Oklahoma" and "Carousel." 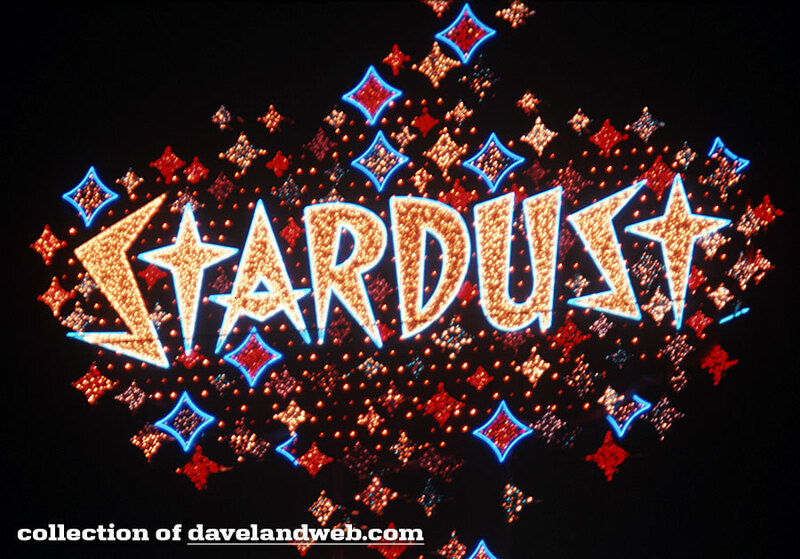 Over at the Stardust in August 1969, I have no idea who these people are, other than possibly Esquivel, my favorite Latino Space-Age musician. 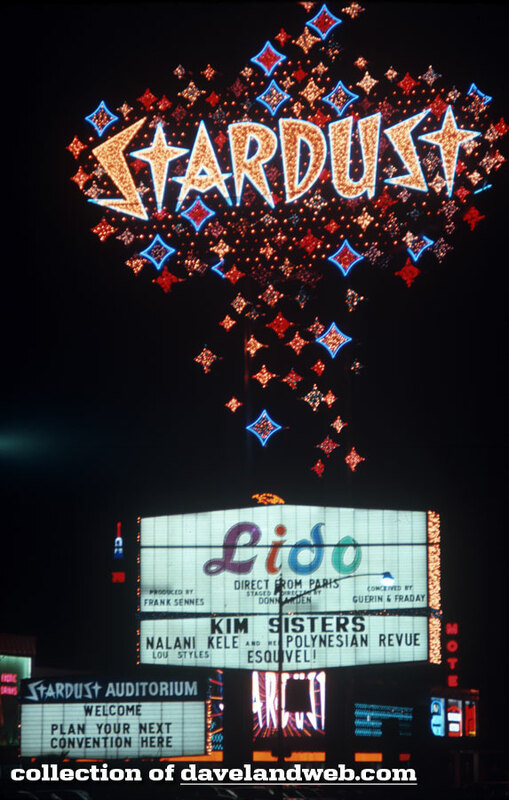 I had to zoom in for a closeup of the Stardust sign, which does just fine on its own! 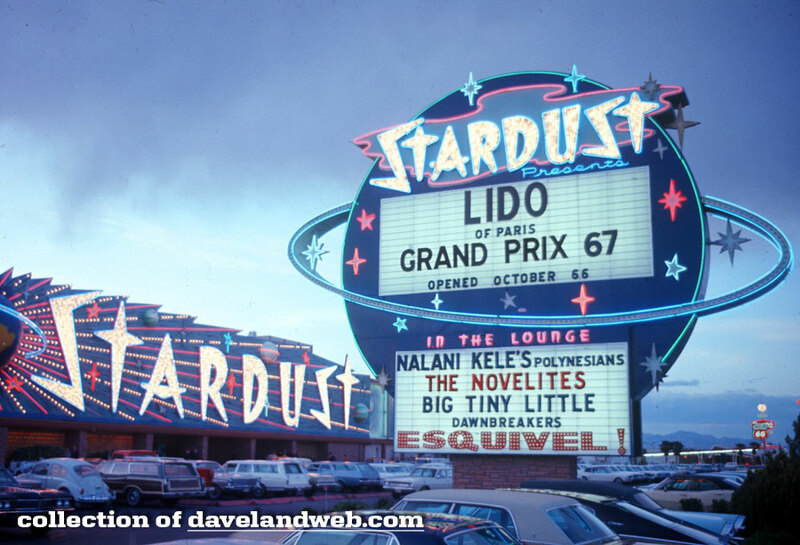 The last one shows Stardust circa May 1987…and Esquivel is still there! How about ending the post with a song from the Chairman of the Board? 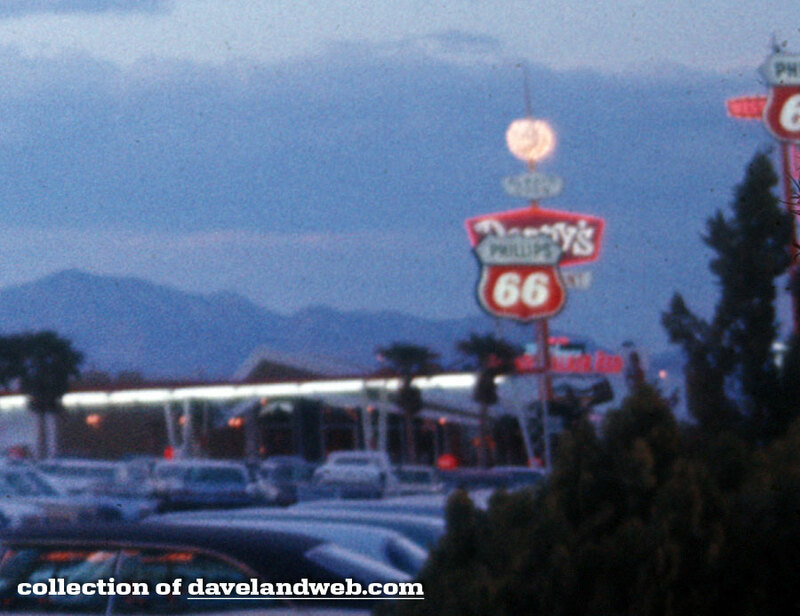 Throw the dice again at my main website and see more Las Vegas photos. Just a quickie today, as I show a photo I captured late Saturday night/early Sunday morning from my balcony. 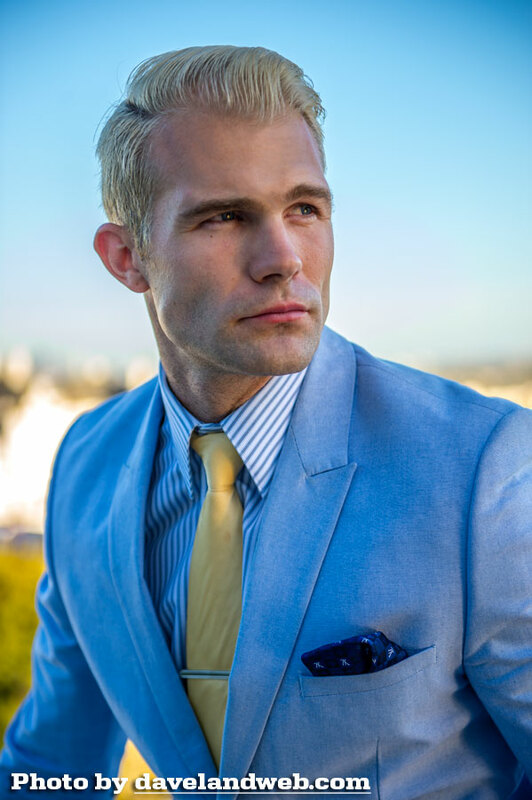 I love the color blue, so sue me…but the rest is for real! 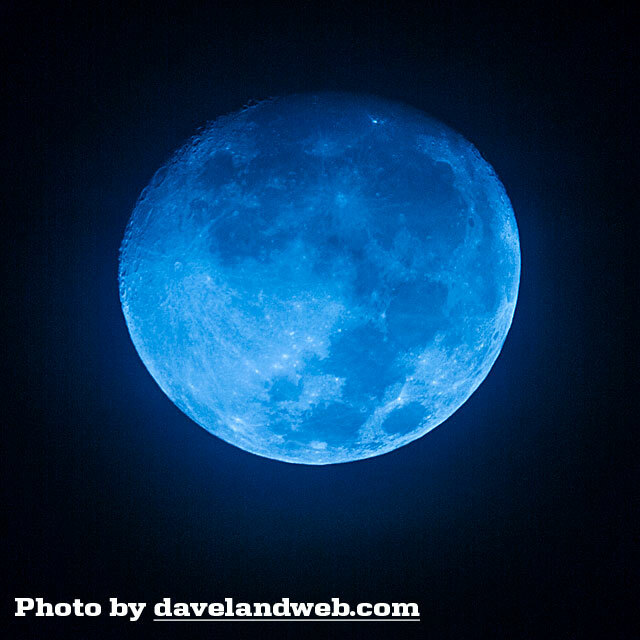 I love my new 600mm lens! With great sadness, I read about the passing of actress Maureen O'Hara. The redheaded legend was a favorite of mine. 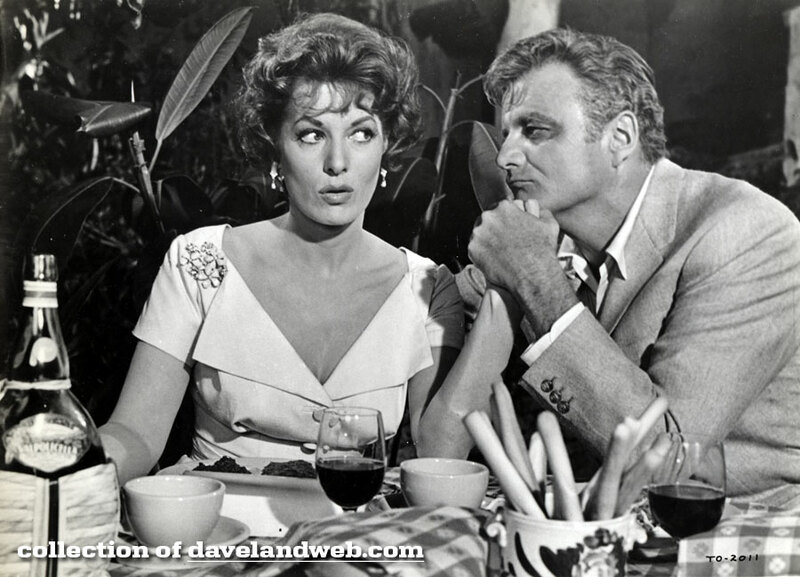 Here she is in "The Parent Trap" with Brian Keith. I get all teary eyed every time I see the scene where they finally reconcile. All kinds of stuff at my main website. Check it out!. 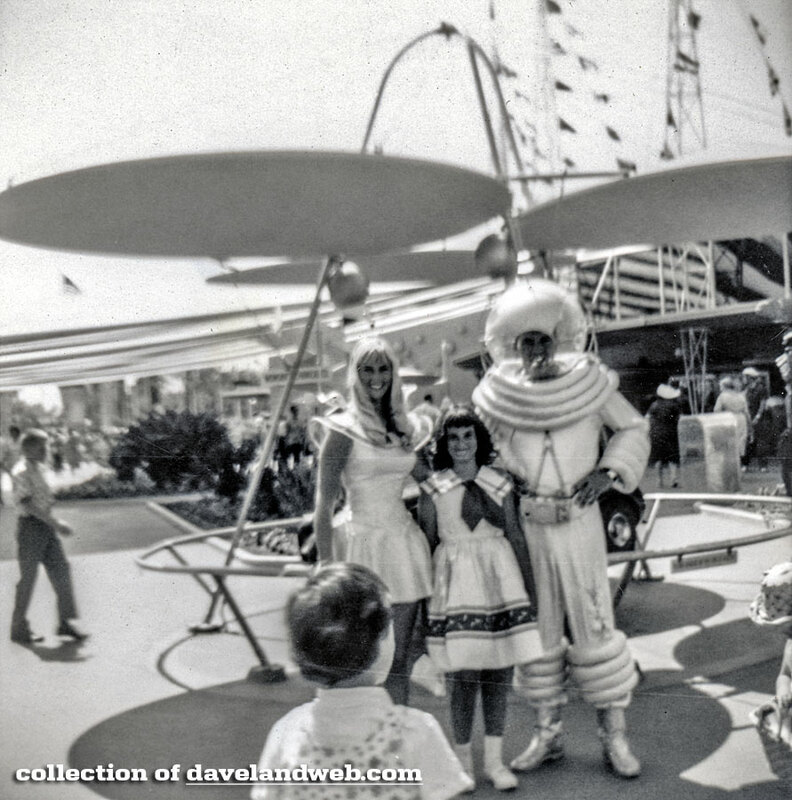 A somewhat grainy black and white of my favorite space couple at Disneyland is today's offering. 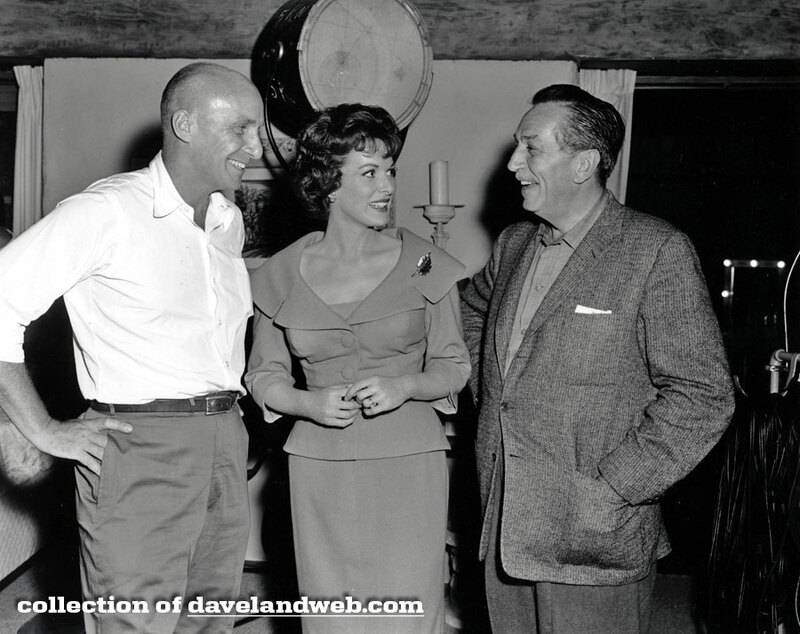 It is undated, but most likely early 1960s, based on this other shot in my collection which shows the same two cast members on August 19, 1960. 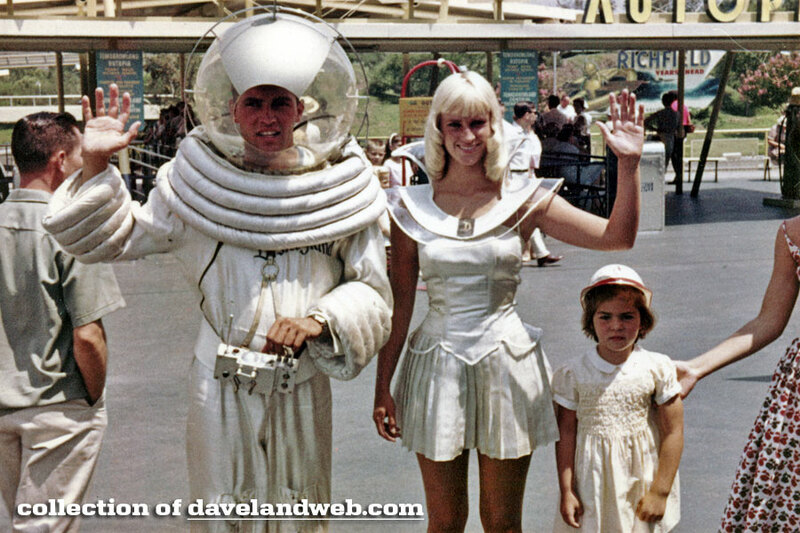 Get lost in space at my main website. 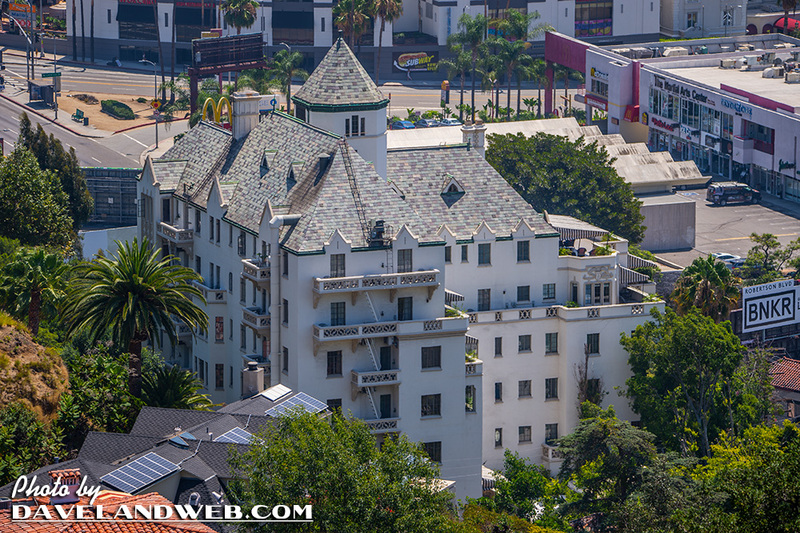 Another post about my Hollywood Hotel obsession, The Chateau Marmont. One of the things I love about it is the decor; eclectic is a good word to describe it, especially in reference to its collection of art. 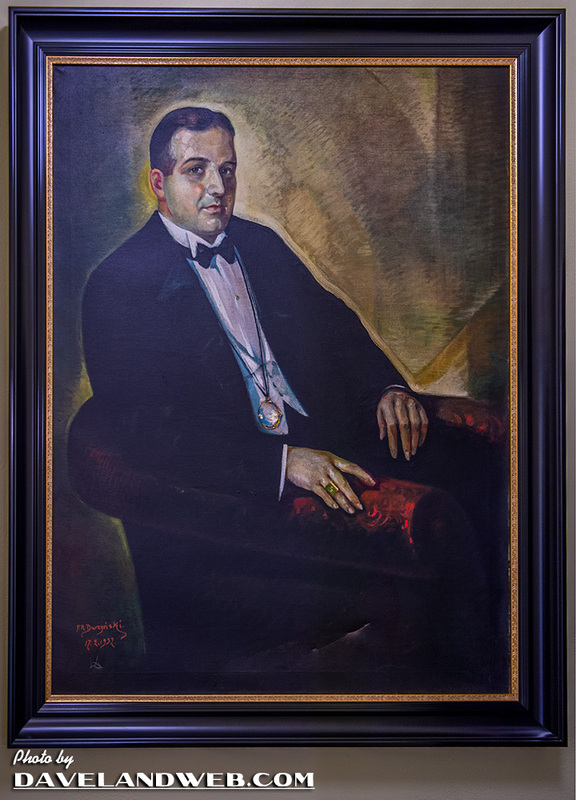 One of my favorite paintings hangs right next to the host stand in the lobby for the restaurant. According to a post on Instagram, famously tanned actor George Hamilton once owned it and sold it but lost track of it. 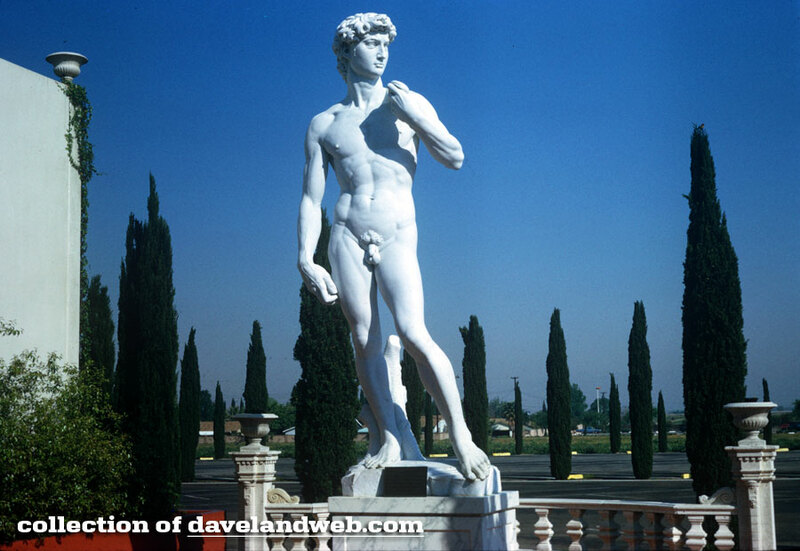 Years later it wound up at The Chateau to his surprise. 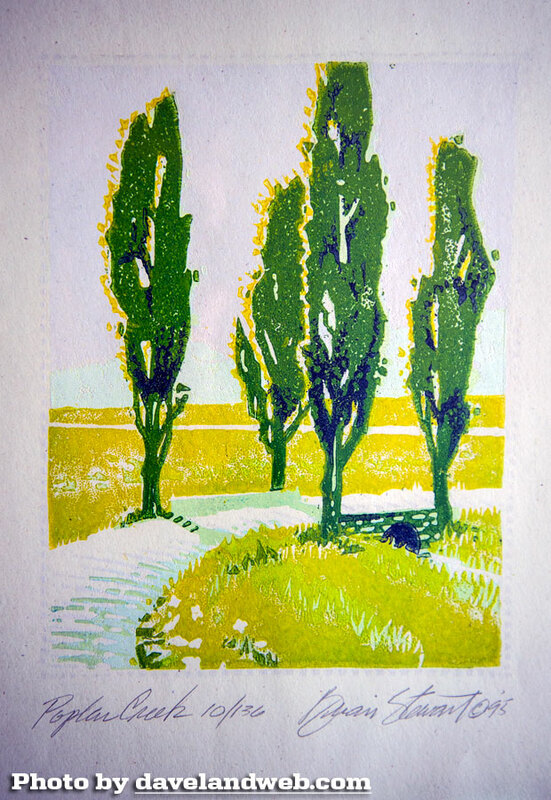 The artist is George Albert Harris, and according to my brief web search, it appears he was an American painter, muralist, lithographer, and educator. 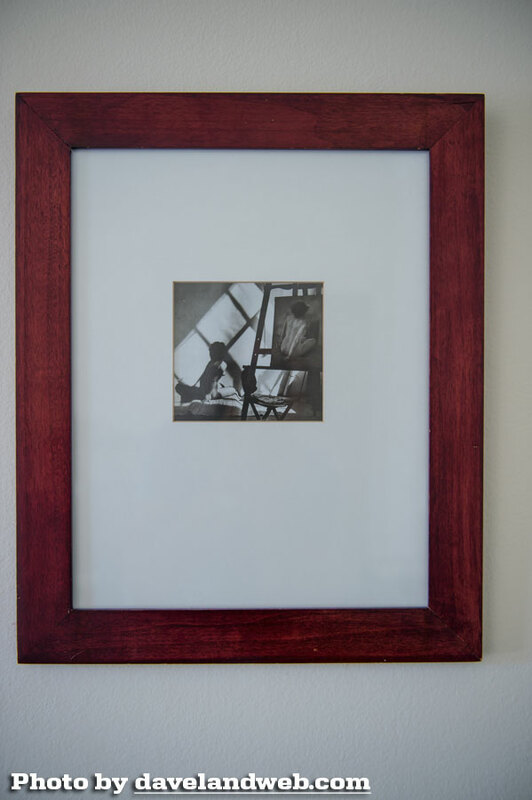 He was a participant in the WPA Federal Art Project and was among the youngest artists on the mural project at Coit Tower. 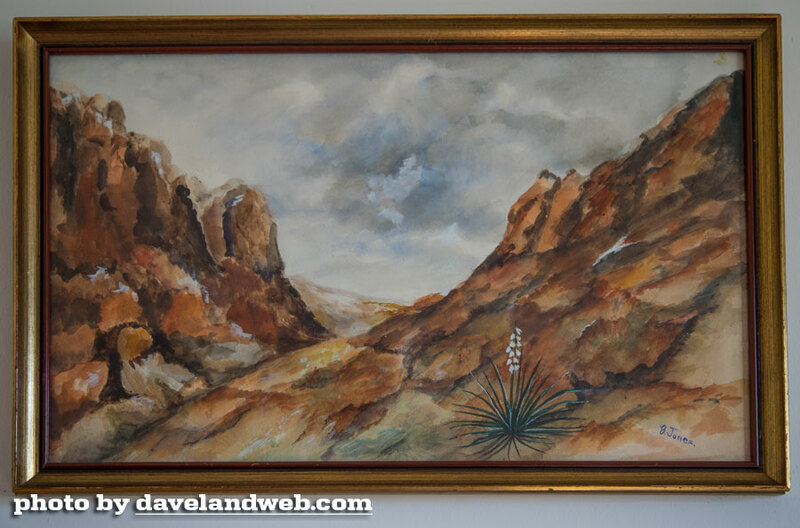 The next painting hangs in the stairwell as guests leave the lobby to trudge up to their rooms. 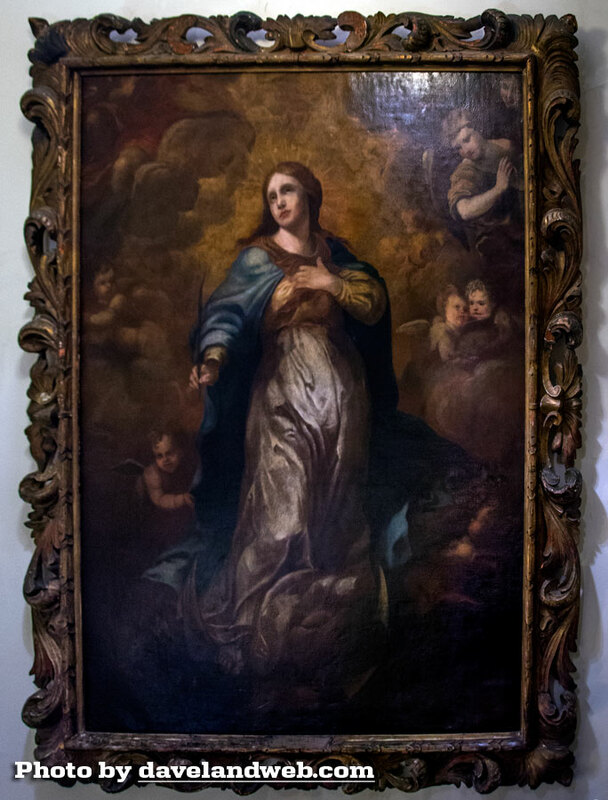 This huge work of art appears as if it could have been pilfered from a grand European cathedral. 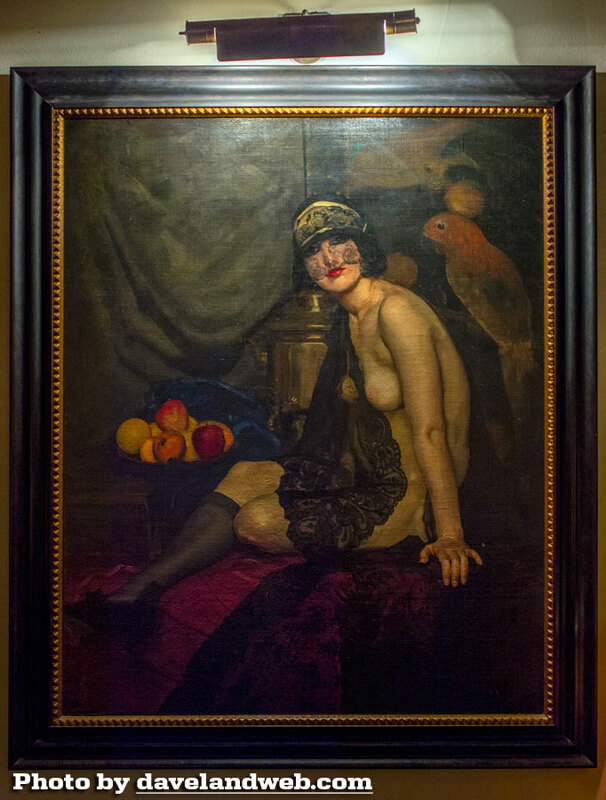 On a previous visit, I encountered this cool deco work of art hanging in the men's room of the lobby. Yes, my camera goes with me there, too. 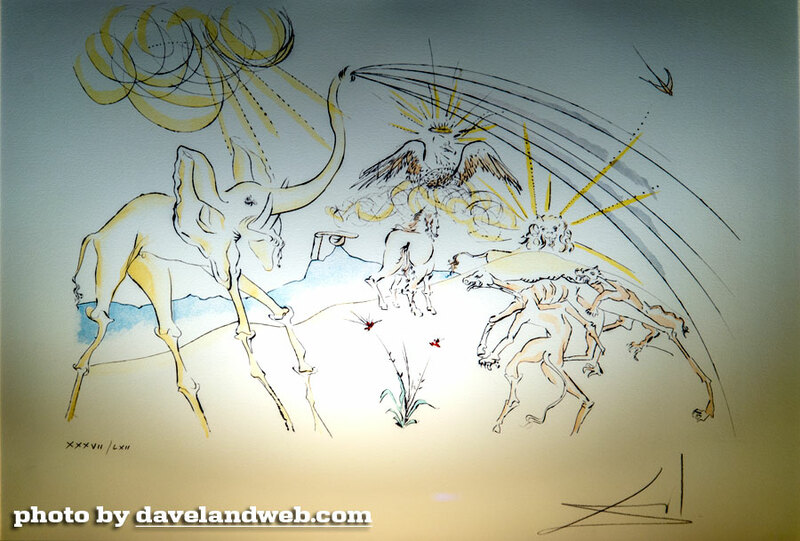 This Salvador Dali print can be found in almost every Chateau Marmont guest room. Possibly there was a sale on this one and they got a bulk buy discount. The cottages near the pool area evoke the Arts & Crafts/Mission era. 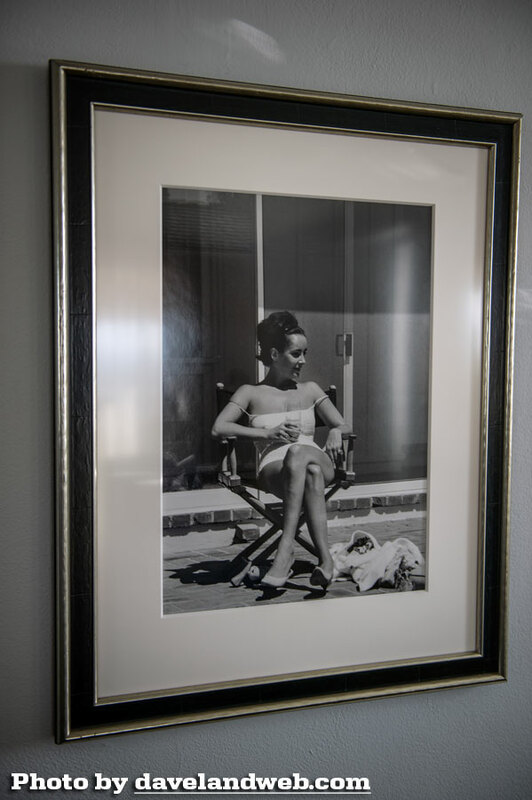 The art on the walls appropriately reflects that style as well. 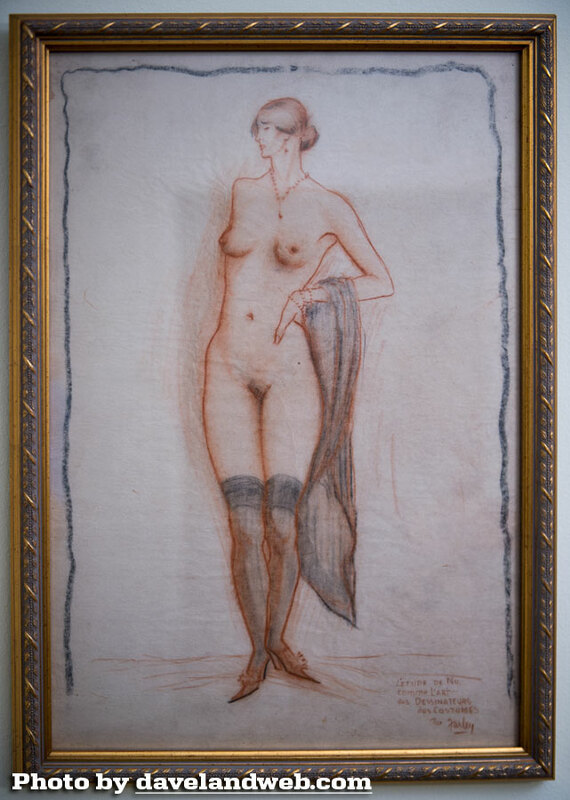 This piece hangs in room 34; I have no idea of its origin or the artist, who appears to have been challenged with proportions. I still kind of like it. 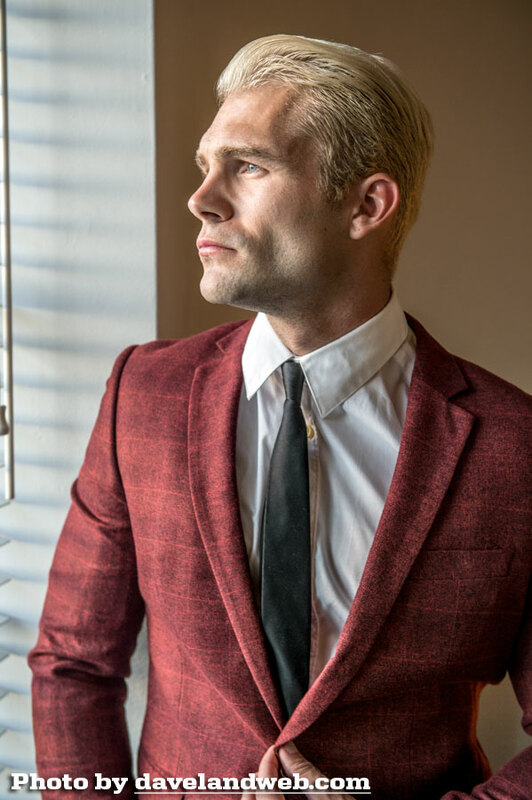 More Marmont at my main website. 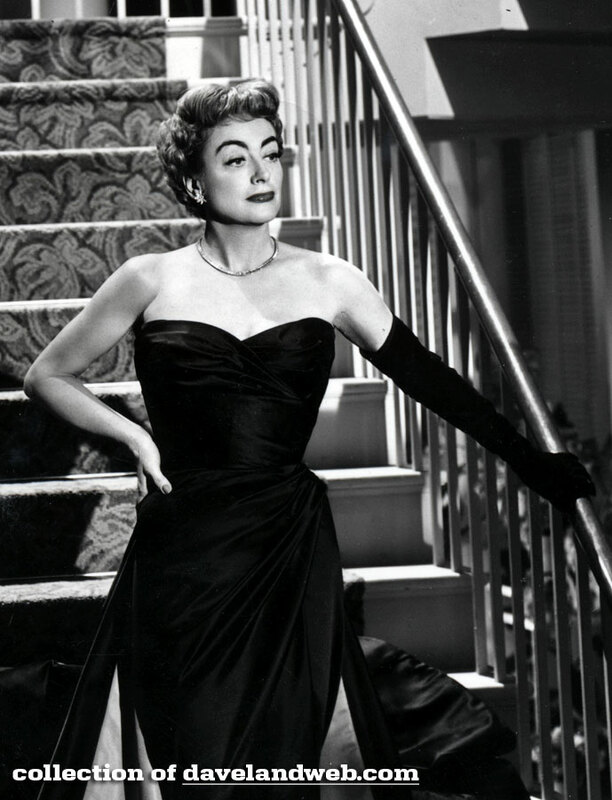 For the 1955 Joan Crawford classic "Queen Bee" that's so bad it's good, this photograph is probably the most famous publicity still. 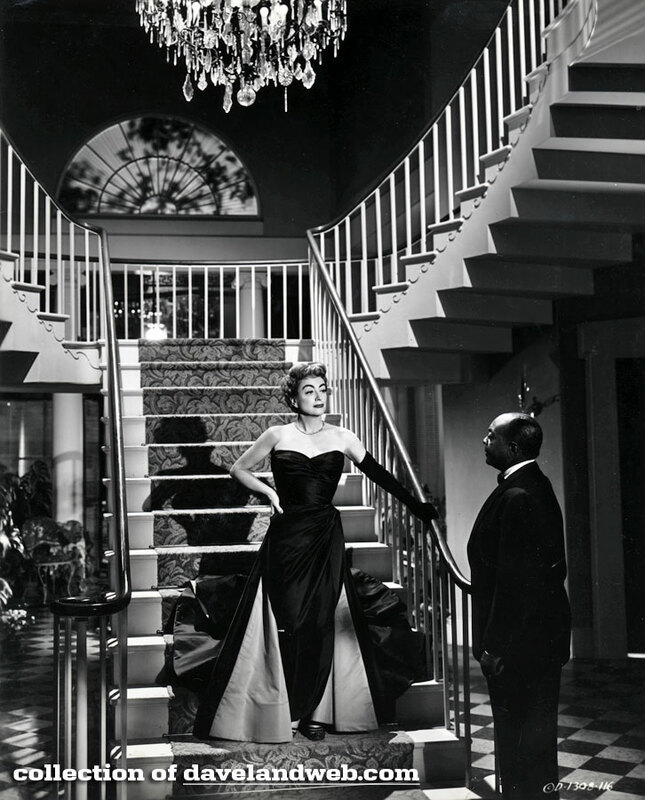 Recently, I came across this other shot on the same set that's only slightly less posed. 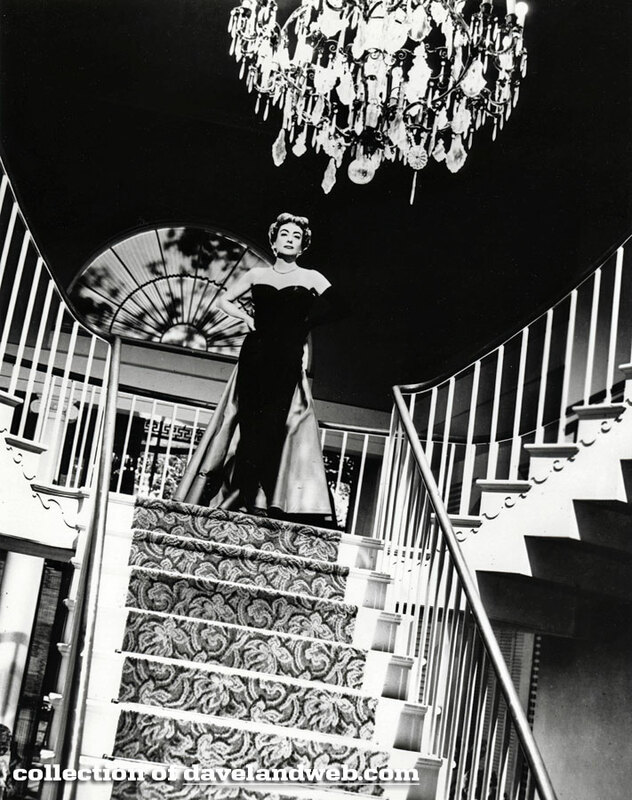 GUESTS FOR JOAN - Joan Crawford's guests are announced by Marvin Lindsay in Columbia's "Queen Bee." I wonder if the meat was rare? More Joan at my main website. 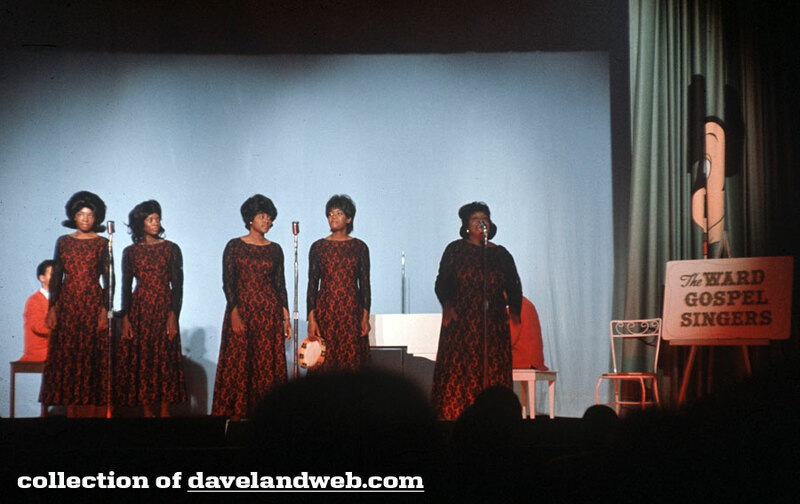 Today's post features two images of the Ward Gospel Singers on the stage of the Mickey Mouse Club Theater in Fantasyland at Disneyland, circa 1964. 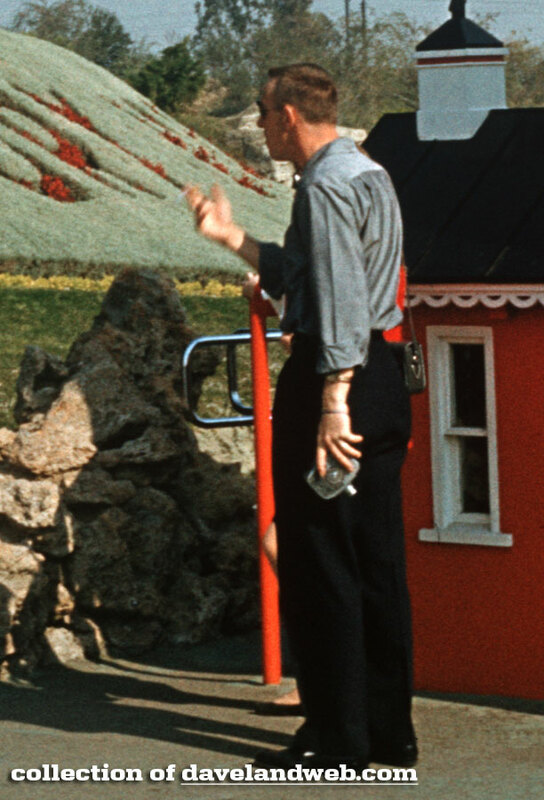 Note the Mickey Mouse head on the curtain; up until 1963 it was the headquarters of the Mouseketeers. 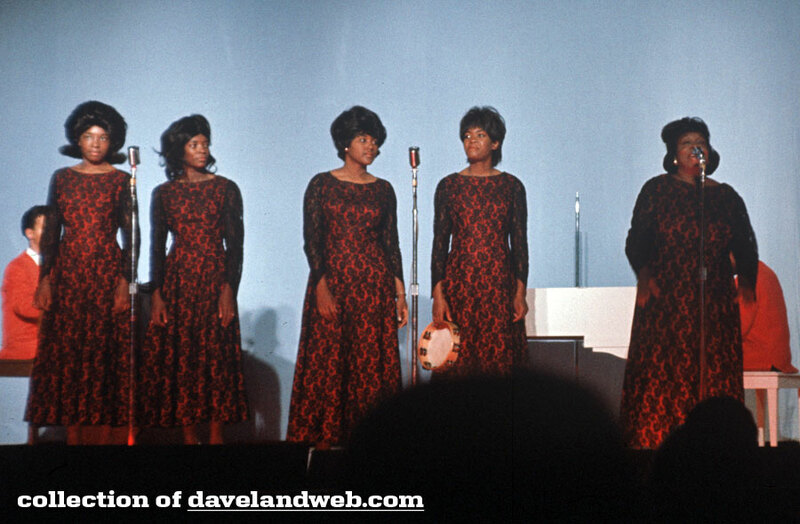 A closeup of the singers; note that there are TWO piano players! 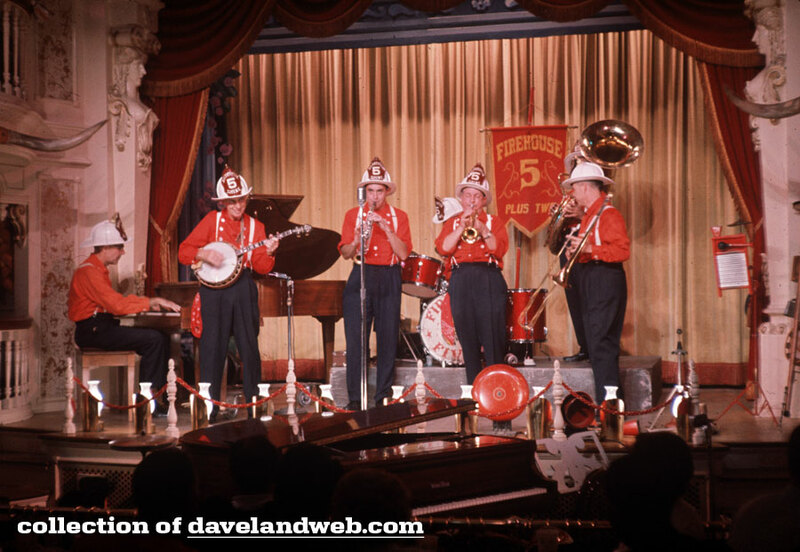 In addition to Harry James and his band, Disneyland After Dark offers the Elliott Brothers' Orchestra, the Spacemen and Kay Bell, the Firehouse Five Plus Two, the Ward Gospel Singers, the Young Men from New Orleans aboard the Mark Twain steamboat and the Royal Tahitian dancers. 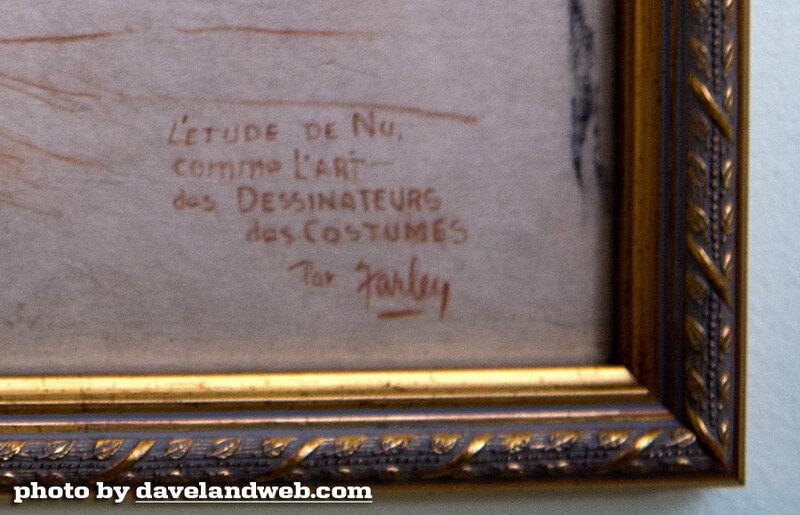 I am "assuming" (oh how dangerous) that these two shots are from that time period. 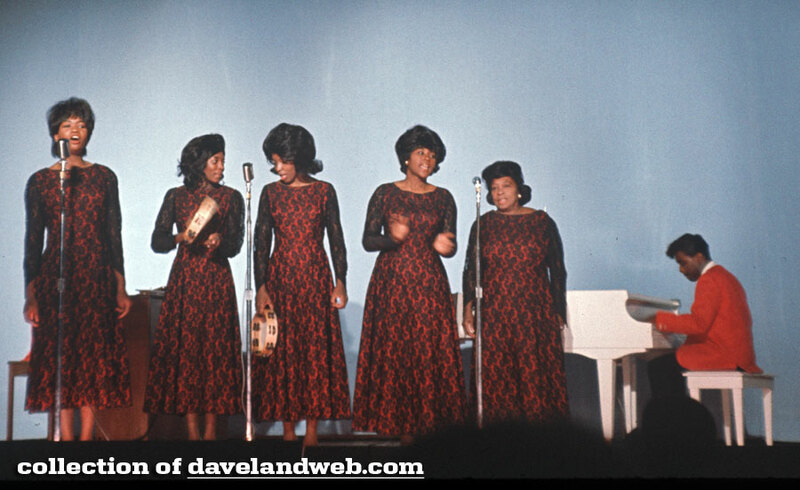 If you'd like to hear what the Ward Gospel Singers sound like, here's "Something's Got A Hold Of Me" from the Buena Vista LP: The Famous Ward Gospel Singers Recorded Live at Disneyland. 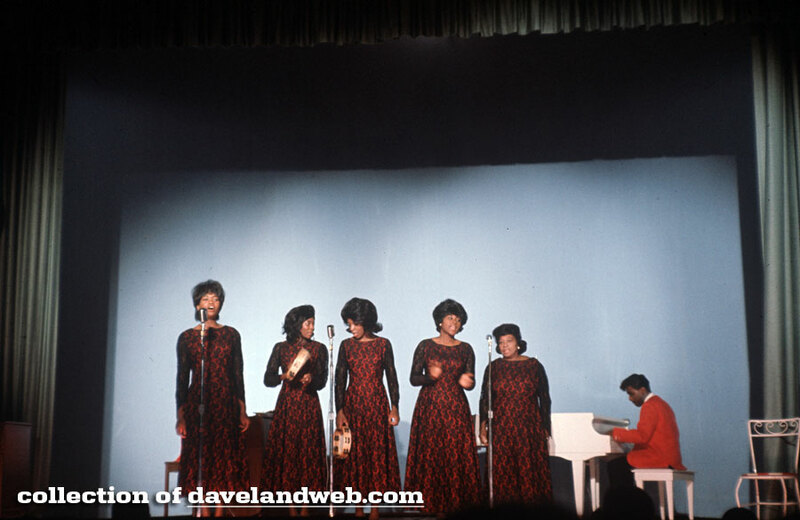 It was recorded at the Golden Horseshoe on April 18, 1963 and featured Viola Crowley, Geraldine Jones (lead vocals), Clara Thomas, Vermettya Royster, Mildred Means, and Malvilyn (Simpson) Statham. Enjoy! 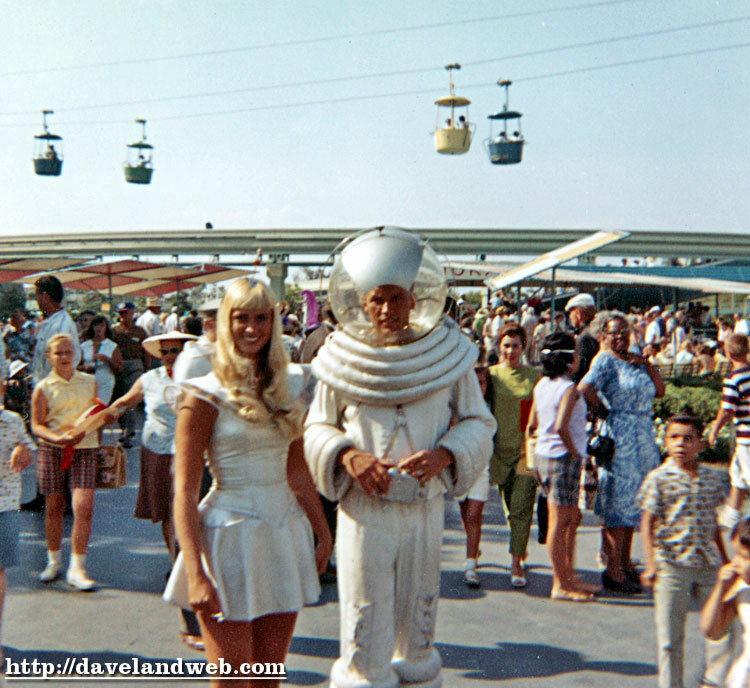 In December 1960, this is how the Christmas of the Future was imagined at Disneyland. 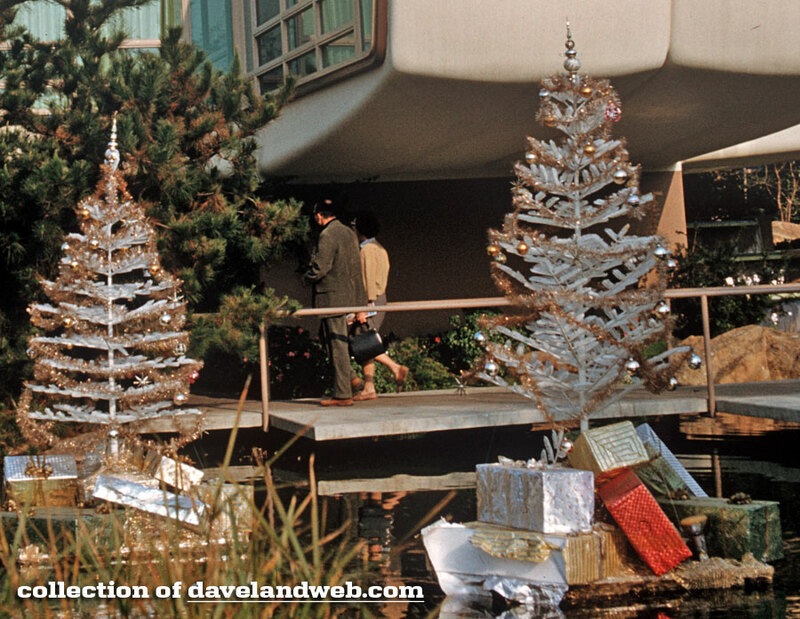 Artificial trees were placed in the small body of water outside of the Monsanto House of the Future with plenty-o-packages tucked underneath. I wonder how many kids tried to jump in the water to fetch those big gleaming packages? 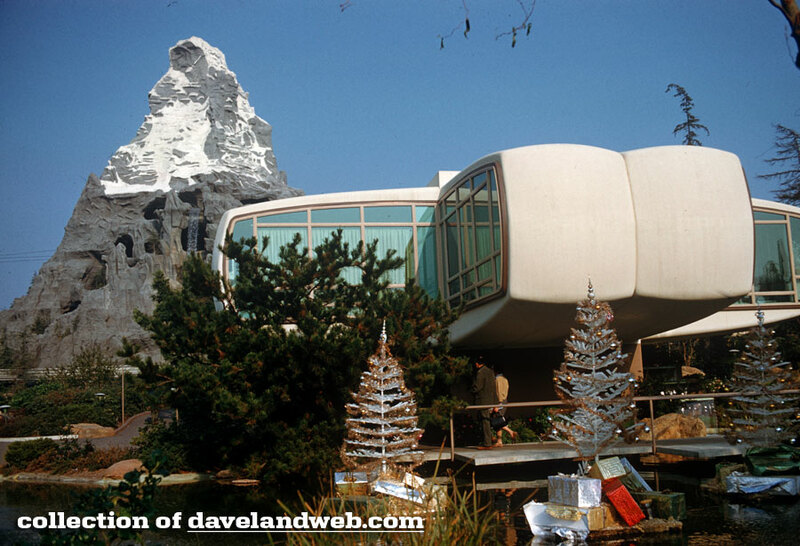 See more House of the Future photos at my main website. 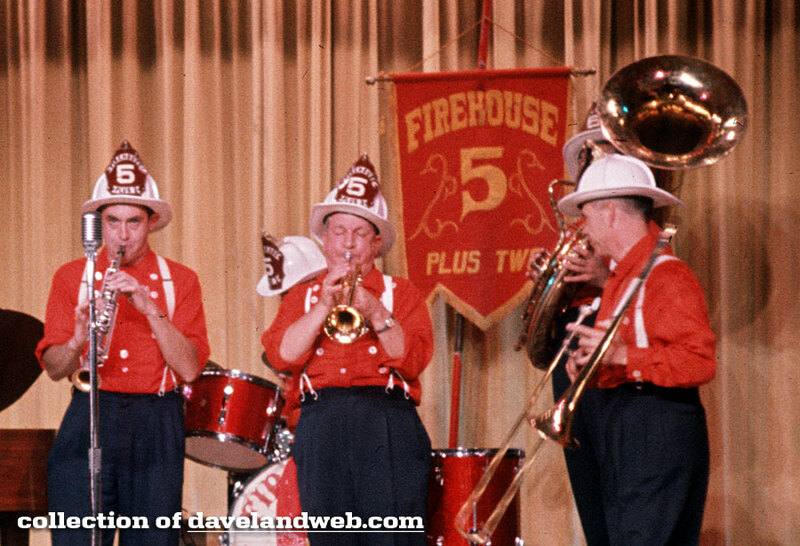 This September 1964 shot captures the Firehouse Five Plus Two music group performing at Disneyland's Golden Horseshoe Saloon. 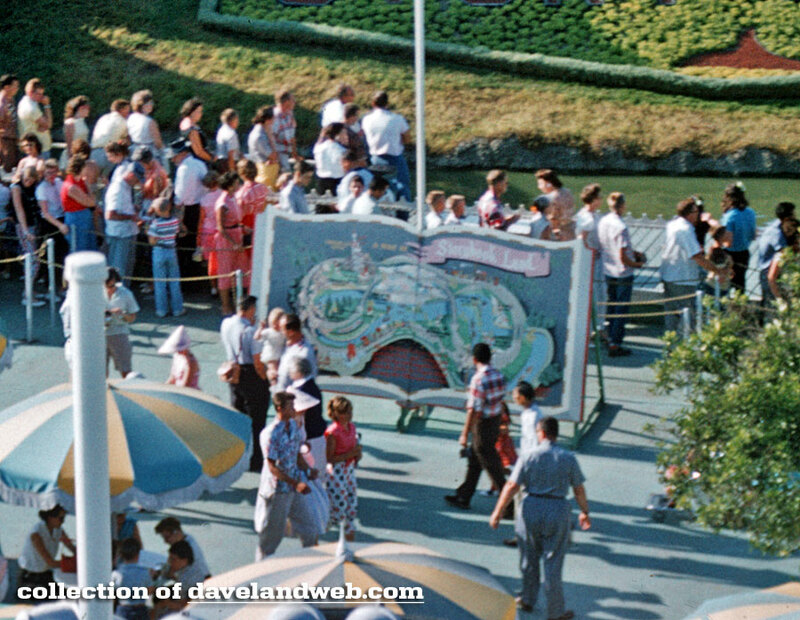 They probably had no idea how fortunate they were to catch this band comprised mainly of Disney artists and animators. From left to right: on piano is animator Frank Thomas, the banjo player was often illustrator Harper Goff but this does not appear to be him. Erdman (Ed) Penner, a writer, is most likely who the soprano sax player is. Danny Alguire, fingerprint expert formerly with L.A.P.D. 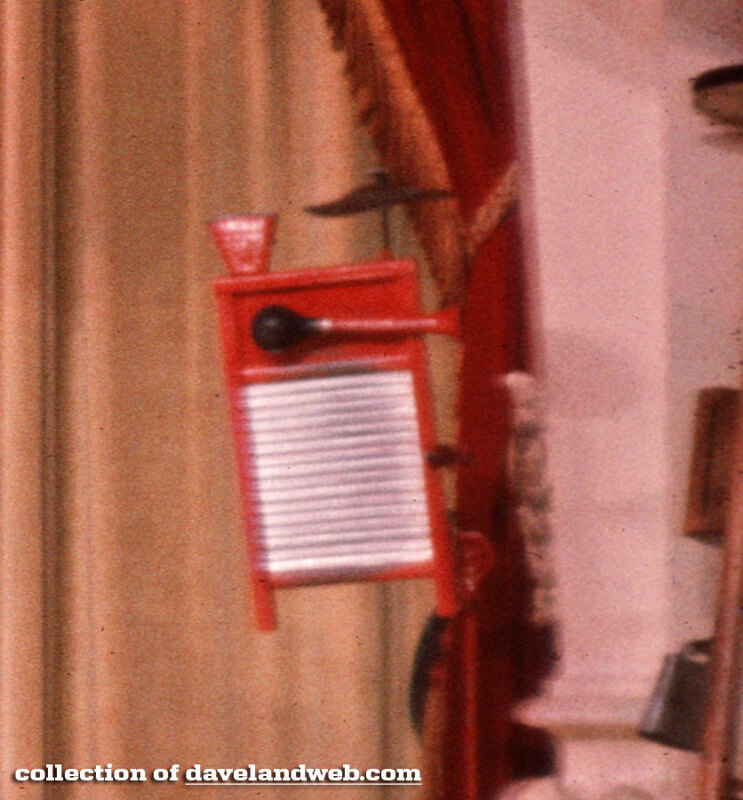 is on the cornet, and I'm not quite sure if that's Ward Kimball on the trombone or not. It could be Monte Mountjoy on the drums but his face is cut out, so who knows. The tuba player could also be Ed Penner if he's not the one on the soprano sax, but again…anybody's guess. I am sure someone will chime in with their educated 2 cents. I'm just as fascinated by this Rube Goldberg instrument! 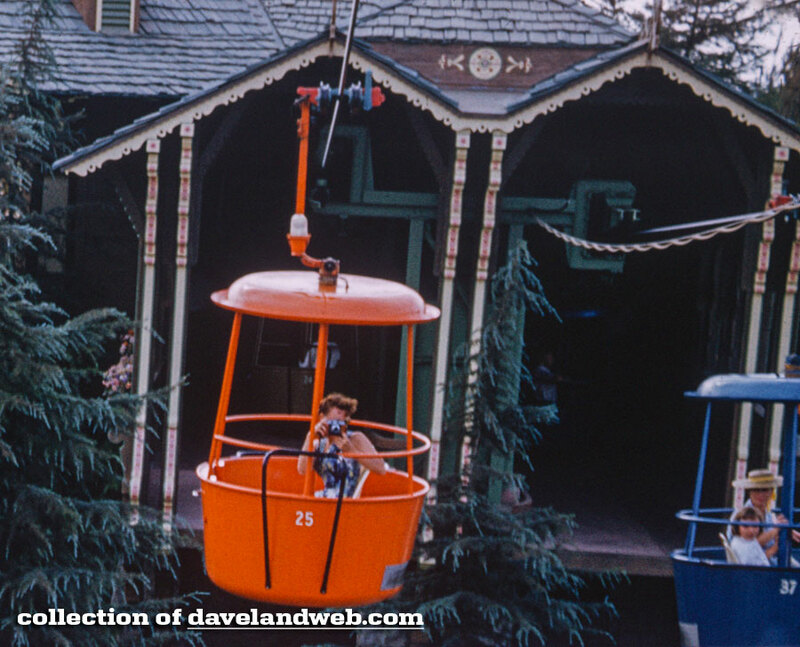 More classic Golden Horseshoe Saloon photos on my main website. 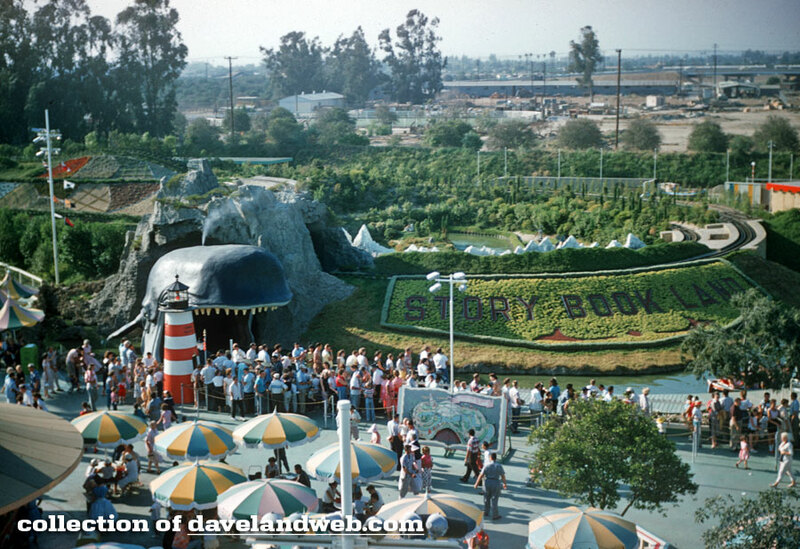 This undated 1950s shot taken from the Skyway shows Pinocchio's Monstro, the famous whale that serves as the entryway to Disneyland's famed Storybook Land attraction. 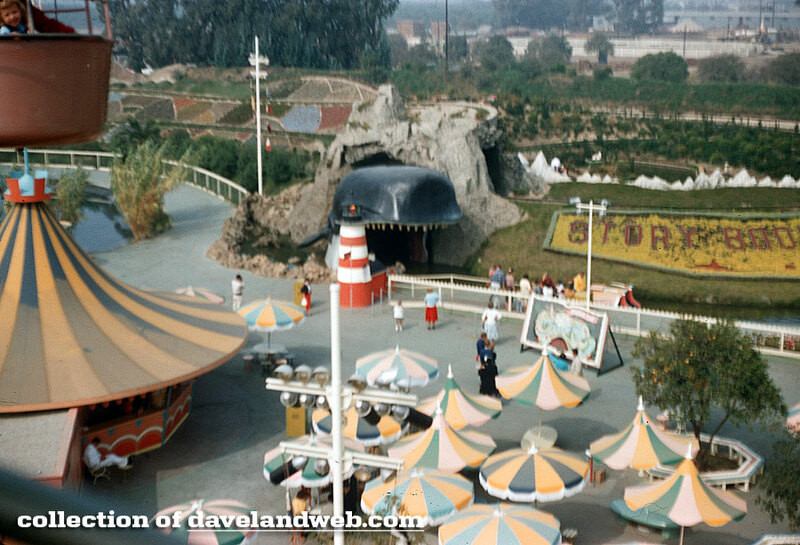 Zooming in, you can see the gigantic Storybook Land Map that advertised the attraction when it first opened. 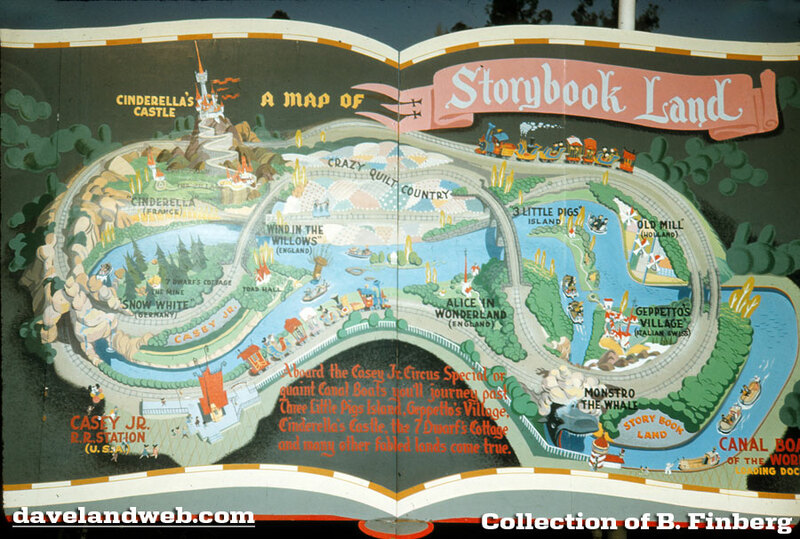 Here's a closeup of that great big beautiful Storybook; wonder what happened to it? 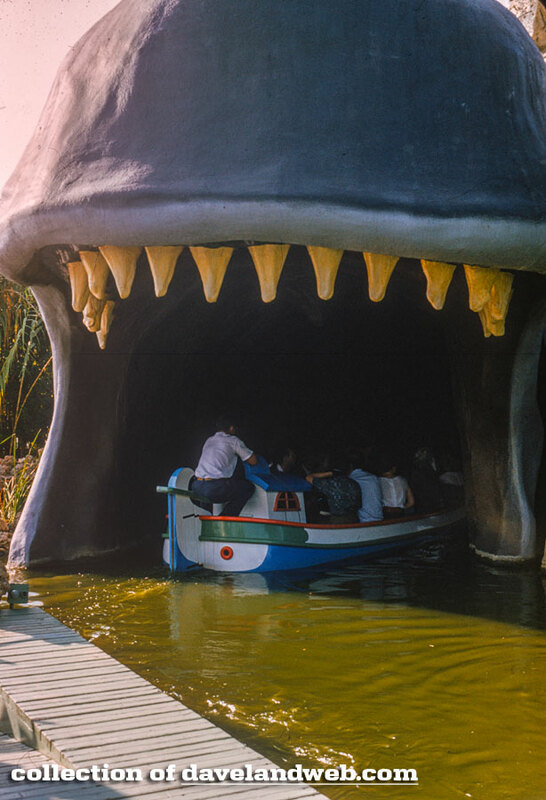 Back to Monstro…thanks to some funky lighting and vintage image fading, he looks like he needs a trip to the dentist. "To be, or not to be…that is the question." 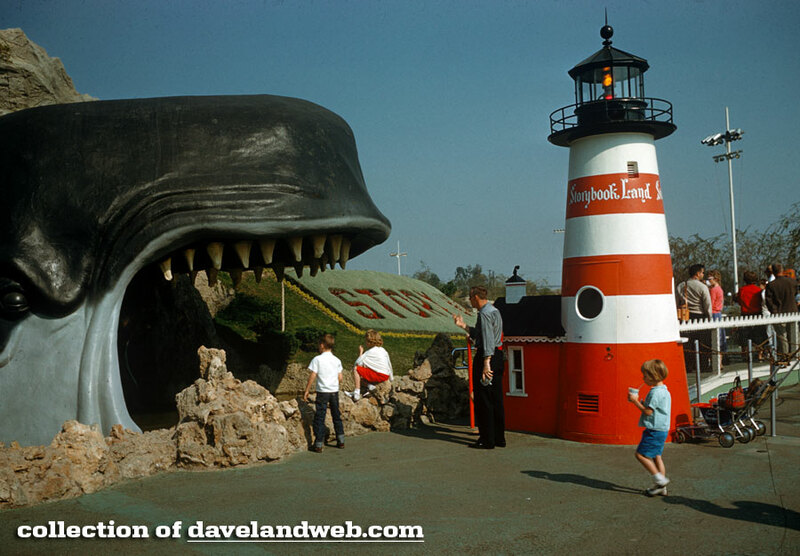 See more Monstro, both vintage & current, at my main website. 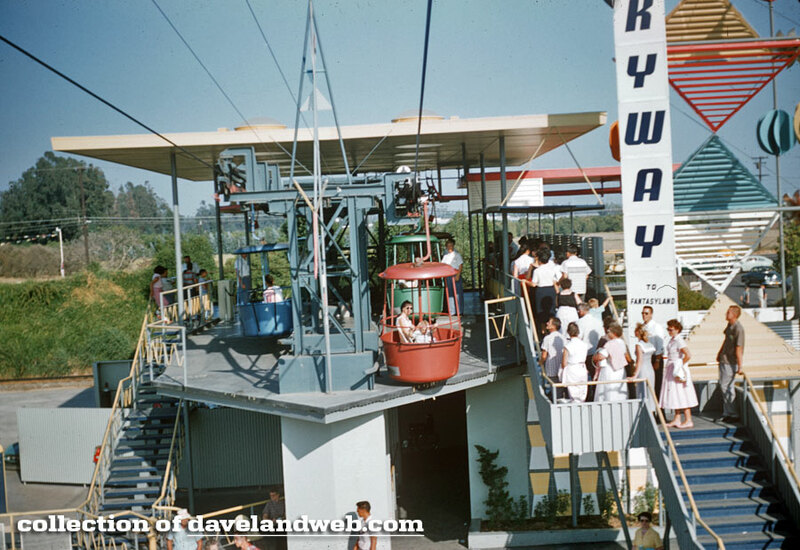 Today you can go from one end of the Skyway to the other, beginning with this 1950s Tomorrowland Station shot. 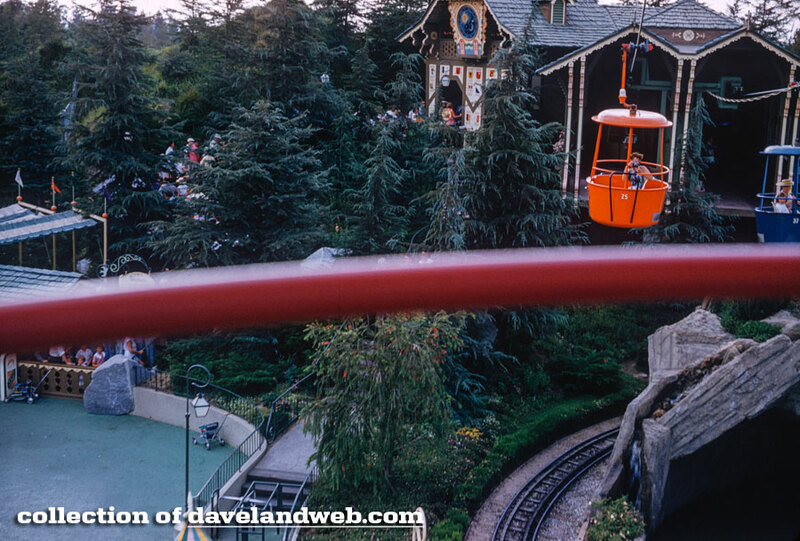 Although the attraction and station no longer exist, guests who were able to ride it still have many fond memories of the scenic overhead views that it provided. Over in Fantasyland, the Swiss Chalet structure still stands, although its fate of demolition is most likely going to occur soon. 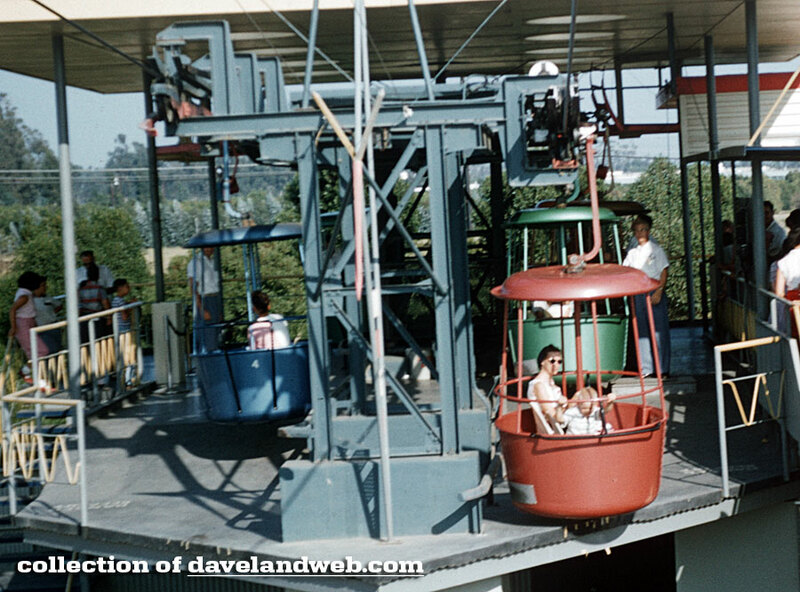 Float on over to my main website for more Disneyland Skyway magic. 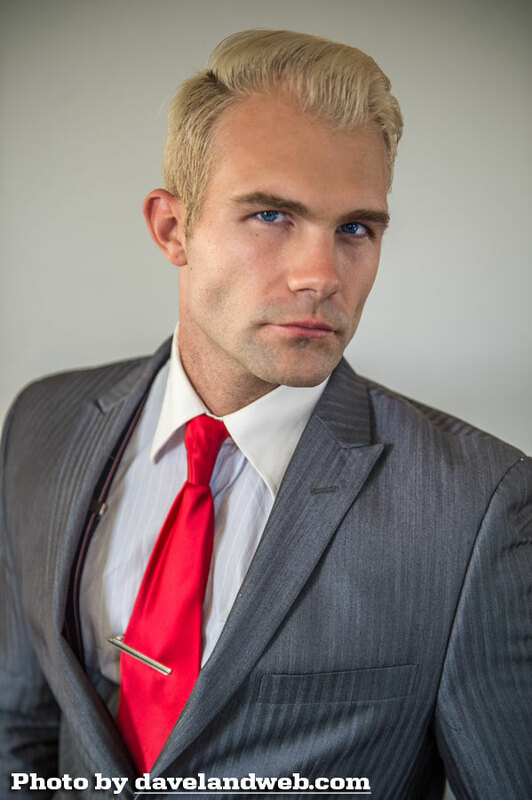 I had worked with Keith Kirkwood, 2013 #6 Maxim Magazine Sexiest Man In The World, MMA Champion, and Movie/TV Producer a few months ago; when he needed a few shots to submit to a magazine he reached out to me. 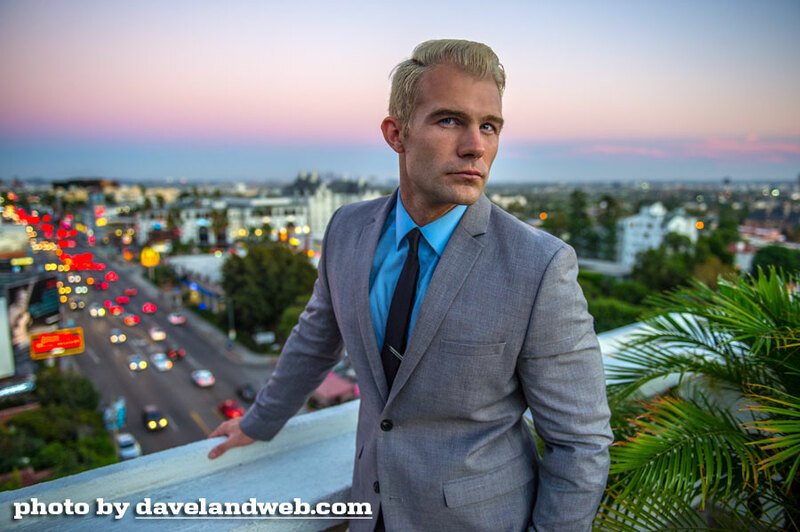 It just so happened I was going to be meeting some friends up in Hollywood so the stars aligned perfectly and I was able to squeeze a shoot in. 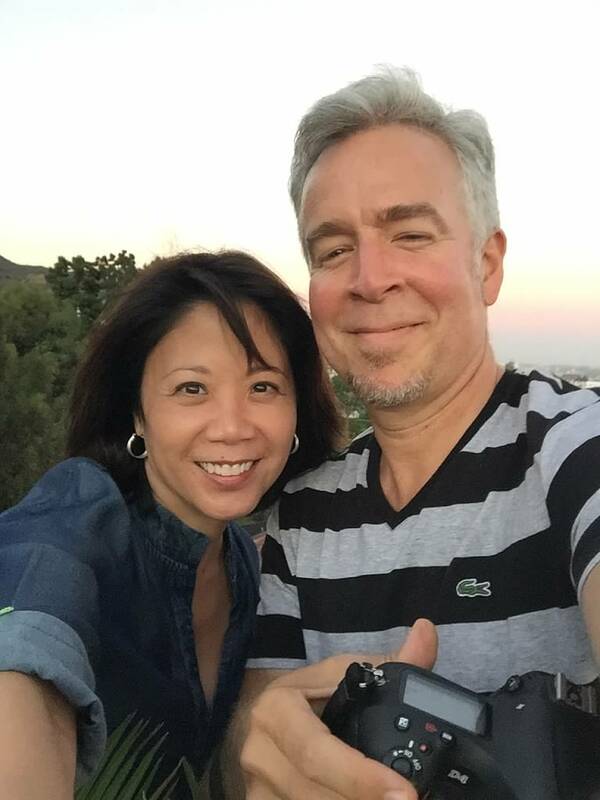 My friend Helen from St. Louis had flown in, and she had no problem hanging out on the sidelines while I was working, especially since Keith is so easy on the eyes. However, she couldn't just sit still. 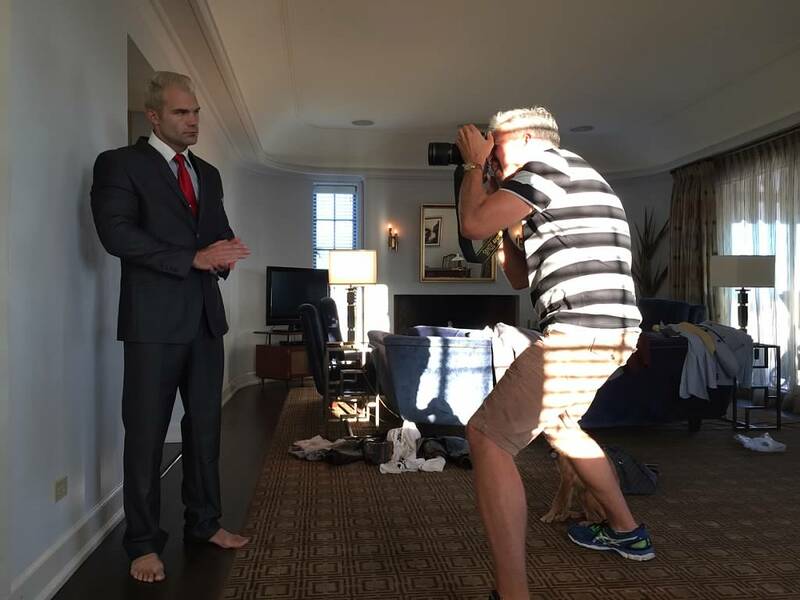 She decided to document what was going on. It shouldn't be long before she gets discovered. 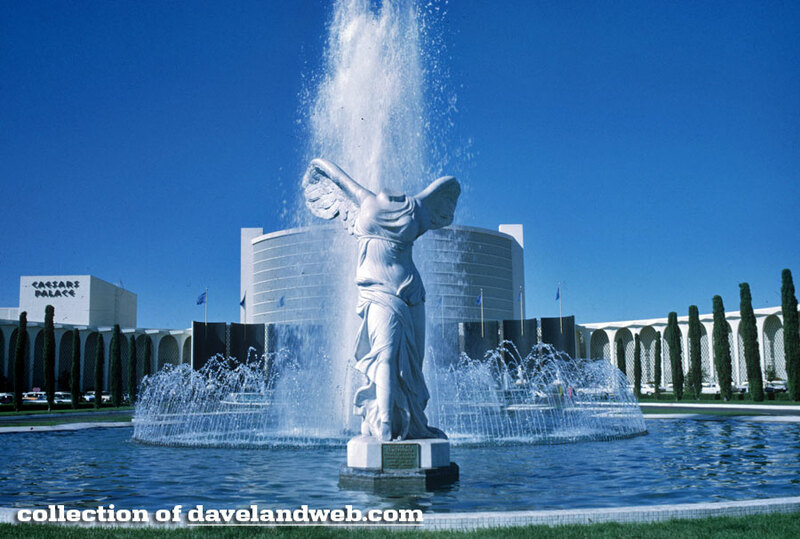 See more of my photography at my main website.